And wondering how these topics can best express themselves in your curriculum and in the daily experiences of students, teachers, and the broader school community? Understanding our relationship to the natural world and our connection with it—and learning how to foster this understanding within our students and our communities—is the subject of Sunbridge’s 2018 Teachers Conference. Designed for early childhood, elementary, and high school educators, this highly practical conference will help you take up these themes in the context of your own school setting and inspire new vision for your work with children and adolescents. Through developing and sharing age-appropriate curriculum and approaches that deepen one’s experience with nature and encourage and support a child’s sense of place and interconnectedness with the world, you will return to your classroom and your school inspired and equipped! Coleen O’Connell, MS (Keynote Addresses and Workshop Facilitation). Co-founder of the Ecological Teaching and Learning MS Program at Lesley University in Cambridge, MA, an innovative master’s degree program for educators infusing their teaching practice with ecological principles, systems thinking, reflective practice, and Action Research, and Lesley University faculty member. Coleen’s mission as an educator for the past 30 years has been to bring people into relationship with the natural world with an emphasis on our interconnectedness through systems thinking. Coleen’s teaching and scholarship are focused on expanding the definition and underlying notions of environmental education to be that of ecological teaching and learning integrated across the curriculum. Focused on changing the code for education so that it becomes the practice of educating for ecological global citizenship, she weaves the concepts of sustainability, systems thinking, deep ecology, intentional communities, and traditional indigenous knowledge into her teaching practice. Coleen lectures and presents workshops throughout New England and has served on the boards of the Maine Environmental Education Association, which in 2013 awarded her the Eberhard Thiele Environmental Educator Award, and the New England Environmental Education Alliance. She earned her BS degree in early childhood education at South Dakota State University and her MS in environmental education from Lesley University. Rev. Patrick Kennedy (Opening Talk). 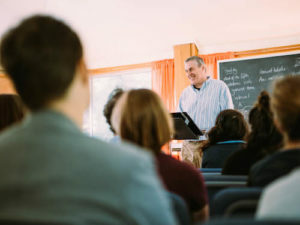 Director, The Seminary of the Christian Community, Chestnut Ridge, NY. A graduate of Kimberton Waldorf School, Patrick attended the seminary in Stuttgart and was consecrated into the priesthood in 2006. From 2007 to 2015 he served as the resident priest in the Washington DC area congregation and now works both as a director of the Seminary and in the local Chestnut Ridge congregation. Prior to preparing for the priesthood, Patrick studied and worked in the field of early childhood education and as a Waldorf class teacher. He received his bachelor’s degree in cultural anthropology from the University of California. Santa Cruz. Calisa Tucker, MS (Curriculum Panelist). Class teacher (on sabbatical), the Rudolf Steiner School of Ann Arbor. Calisa has been a class teacher at Ann Arbor since 2002 when she joined her first class in second grade, taking them through eighth grade in 2010 before beginning her second round. Prior to becoming a Waldorf teacher, Calisa worked on an organizational learning and lean manufacturing internal consulting team for Ford Motor Company. Lessons learned in the automotive industry inspired her to seek out an education that nurtured systems thinking, creativity, and a love of learning. A faculty member of Sunbridge’s “Approaching the Grades” Summer Series courses, Calisa received bachelor’s and master’s degrees in industrial and operations engineering from the University of Michigan and did her teacher training at the Waldorf Institute of Southeast Michigan. Jeannine Davis, MS (Curriculum Panelist). Horticulture and gardening teacher, The Waldorf School of Garden City. Jeannine created, implemented, and teaches the WSGC’s organic gardening curriculum for grades one through eight. This program includes renewable energy and sustainable agriculture practices, cooking, canning, fermenting, entomology, botany, and making medicinal salves from weeds found on campus. She organizes her school-wide Earth Day event each spring, where students, faculty and staff focus on planting for a bio-diverse species and care for the school grounds; manages the school’s solar powered greenhouse, organic food, herb, and flower gardens and composting program; supports a farm to table cafeteria; recently co-piloted an eighth grade sustainability and science program; and is also a key figure in her school’s coming-of-age experience to honor the transition and challenges of entering adolescence. Last spring, she was a featured panelist at a conference at Hofstra University, speaking on “Importance of Local Agriculture to Health and Education.” Jeannine graduated from American University with a BA in public relations, earned her MS in Waldorf Education from Sunbridge College, and a certificate in Biodynamic Agriculture. Robin Gucker (Curriculum Panelist). Longtime Waldorf early childhood educator, outdoor educator, and farm and forest kindergarten teacher. Robin most recently served as faculty chair and teacher of the farm and forest-based outdoor kindergarten program at Lakeside School at Black Kettle Farm in Essex, NY. Her eighteen years of teaching experience in Waldorf settings also include nine years teaching at Lake Champlain Waldorf School. Robin was a founding parent at the Northern Lights School, a Waldorf-inspired school now located in Saranac Lake, NY, and, prior to her work in Waldorf Education, taught science and outdoor education at North Country Camps, Pok-O-MacCready Outdoor Education Center, and North Country School. She has a BA in biology and art from the University of Vermont and a certificate in early childhood education from Sunbridge College, and completed her training in Spacial Dynamics®. Friday evening, November 30: Doors open at 6:30pm for check-in registration. Conference begins at 7pm and runs until 9pm. $285 (includes Saturday breakfast, lunch, and mid-morning and mid-afternoon snacks, and a $25 non-refundable registration fee). Campus housing is reserved directly through Threefold Educational Center. Online registration is open through noon on Friday, November 30. If you haven’t registered online and still wish to attend, you may do so as a walk-in registration providing space is available. Walk-in cost is $300. 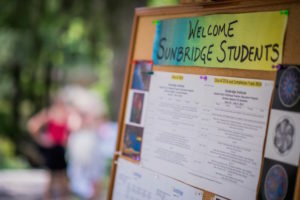 Contact Admissions, Alumni, and Summer Coordinator Penelope-Myles Voss at info@sunbridge.edu or 845-425-0055 x20.